of Karpathos, Greece. We are located right next to the beautiful and famous beach of northern Karpathos named Potali. Welcome to a 20 year friendly and family run business. Enjoy your stay! Our Hotel consists of seven spacious, beautifully Aegean style built apartments all with an amazing view of the sea and the nearby area of Lefkos. Get the opportunity to stay in a traditional Karpathian style bedroom called "soufas" at Akrogiali Hotel. All apartments have separate fully furnished bedroom, a separate kitchen and spacious bathrooms. Our Hotel is approved by the official Greek National Tourism Organization. For any further information, please get in contact with us. We will be happy to assist you. 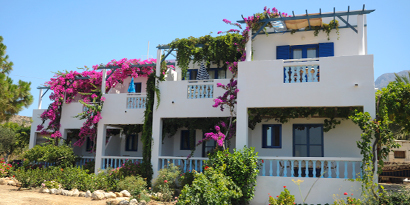 Akrogiali Hotel are built in a verdant and idyllic location in Karpathos. Just 70 metres from the sea and close to the centre of the nearby village of Lefkos. The beautiful scenery with the rich yards, the fruitful orchards the olive trees and the fragrant gardens, characterizes the area Akrogiali is located. This beauty is completed by the wonderful view from all our apartment’s balconies. The dreamy beach of Potali teamed with spectacular sunrise and sunsets will be right in front of you.